I luv the collage style and color!! i love all 3 of these… and hope I win them! Especially since it’s my 30th bday today!!! 🙂 I’m a fan of all of your work, though… you have quite a talent…. keep it up and God bless! I follow your blog and I am a fan on Facebook, plus I posted the link to the contest on my profile. Unfortunately, I don’t blog or twitter…. So, count 5 entries for me! I love the messages of this artwork and it will compliment the pieces I already purchased from you for my girls’ playroom!! I can’t wait to finish the room – we’re almost ready to paint and then I can put up the prints!! Actually, the Good Morning Sunshine and Goodnight Sweetheart might go in their bedrooms – so sweet! I love this artwork! My baby is my sunshine…have always wanted a picture that says it. LOVE the colors. And I have sung “You are My Sunshine” to my son since he was brand new. Love your prints! Very cheerful and would be the perfect decor for my sister’s nursery! I LOVE this new artwork, especially the “Protect Our Water” because it compliments the eco-healthy environmental theme we have at our new Growing Green Child Development Center! I am looking for ways to inspire our children everyday and this message is PERFECT! Plus all the prints are done on recycled paper with soy ink with eco friendly packaging! I would love to see MORE Eco “theme” artwork with messages!!! Great job! Sorry I also forgot to do a total! Thanks for the positive message!!! I love all of Children Inspired Designs work. My daughters room is beautiful thanks to this website! I love the goodnight and good morning prints I think that they are beautiful. I love decorating with birds. All of the artwork is beautiful, but my favorite song to sing to all my kids is You are my Sunshine, so I love this design the most. When I wake up the kids in the morning, I open the windows and say “Good Morning Sunshine”, because they are my sunshine! I was referred to Children Inspire Design by Lynn Troha. I am so inspired by your collages. Have just finished a wonderful children’s literature course for teachers and we finished with a big Eric-Carle-love-in. I think that like Carle, your work finds the magic in between all the pieces and knits it altogether with pure joy. Um, sorry, again with the multiple comments! I follow your blog, am a facebook fan, and just posted this to my profile to gather more fans for you! So, is that 4 entries and fingers crossed?? Great artwork! I love teaching my daughter to love our earth! I love the bright colors of these prints! I’m also a fan on facebook, so that’s 2 entries for me. posted on my facebook page!! I have the #s 1-10 & tree in 8×10 & you are my sunshine in 8×10. I fell in love with the simplicity of your artwork while I was pregnant & now I love them even more and use them as a learning tool for my soon to be 10 month old. I just adore all of the pieces that we have! i love the positive messages of these prints. the images are beautiful and the color is uplifting. These are just adorable… perfect for a nursery. I like how they express such great feelings to your children, they are very comforting. I love your pictures! The great colors and simple designs are perfect and so appealing. They look great in my nursery, and I know my friends love them too. Plus, the eco-friendliness of your designs and themes are right up my alley! Love, love, love. Thanks for all you do. oops, forgot to include 6 points. I put you on my blog so my friends can find you! I can’t tell you how much I love these prints. They are playful and stylish but also convey a meaningful message which is so important. I would love these prints for my son’s nature themed ‘big boy room’ which I’m working on at the moment as he is all too quickly outgrowing his nursery. I am a fan on facebook and have posted the contest link, so I think that is 5 entries! Thanks again for another great contest! I LOVE these! Such a sweet design that is versatile and can be loved by boys, girls, men and women! I could see myself hanging these in my daughter’s bedroom or even in my kitchen. What a better place for ‘Good Morning Sunshine’ than on the wall over my coffee maker? Amen, Kate! There’s nothing better than some coffee and a little Sunshine!! I love the combination of words and images! LOVE THEM!!!! I love the colors! Such unique pieces!! Simply love them! I love the bold colors and the sweet messages! Love the new artworks, they remind me of retro advertising/radio posters. Colourful, vibrant and original as always. I already have your world map collage artwork up in my classroom and my 30 little 5 year old darlings have in the past created their own version of your artwork as a whole class. 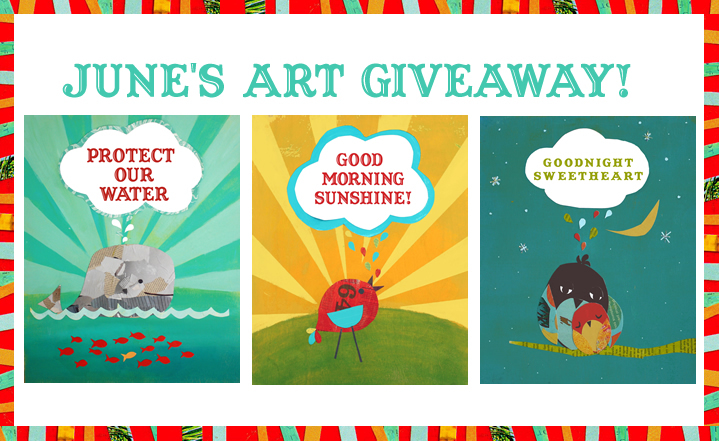 It would be great to add these three to the walls of the classroom, especially the ‘Good Morning Sunshine’ artwork as I have 30 little sunshines who brighten each and every day for me!!! My favorite is the protect our water as well (We live on the Gulf Coast), although the other two really make me smile, and I can see them in my children’s rooms. I am a facebook fan already…. & your blog link is in my blog. I love the good morning and good night messages! How sweet — and true to the title of your company: Children DO inspire design! Thanks so much for the thoughtful post. I LOVE LOVE LOVE it when someone completely understands the message of my work. PS- my son thinks the the orange guy was adopted. I love this artwork because it’s so cheerful and bright!! I discovered you on etsy and LOVE your art! I’ve been looking for some art for my baby who’s due in August and am planning on purchasing a set of the forest friends and an alphabet. It will look great in his room and it fits our family’s style and philosophy! Couldn’t find “become a fan” button on FB but did hit the like button… And posted on my profile. Because I love whales and my nn is Moby! I love anything with birds and bright, perky colors. I really like how these prints are child-friendly without being cutesy pastels. I’m also a fan on fb. Thanks! I am in love with those prints! I love the colors, the meannings and the cute little animals. I love the new artwork, because it’s so colorful. It would look great in my daughter’s nursery! I love the colors. My kids would love the whale. Thanks. I am a FB fan, email subscriber, and follow you on Twitter! The bright colors are perfect for my son’s nursery. I love the simple messages on the art as well. I love the simplicity of your style, the colors, the messages. They are all beautiful. Thanks for sharing your talents with us. (Also a fb fan and blog follower–3 entries). i like the simplicity and the “folk art” look that they have. Oh my gosh, these would look darling in my daughter’s room alongside her set of counting cards. I an an e-mail subscriber and have added a link on my website. I love the good night and good morning pieces; what a nice pair. And the “protect our water” piece is fantastic; I look forward to hopefully seeing other versions of eco-positive messages. Thanks! I love the bright colors! These prints would look great in my little guys room! Great job Rebecca. You’re on Facebook page and I officially “like” you (which I did before, of course.) I like the series! I really like the vintage look. Is there any better way to educate our children than through the powerful use of beautiful pictures? I have two little girls and want them to understand early in life how important it is to protect our world and appreciate its beauty. Your artwork is such a fun way to help achieve that goal. I already have a few pieces and I keep thinking about how many more I can give as gifts! Thank you! My new grandson will be born in September to my son and his wife who are amazingly “GREEN.” What better way to enhance our little guy’s nursery than these beautiful prints for his room! I am loving these new prints of yours, all three. I especially appreciate how they can go either way gender-wise, which is right up my alley with all boys running our roost. I love this artwork. I learned about it from a friend of mine at Urban Sherp (urbansherp.com) and bought two pieces. One is the numbers poster which is currently shining in my daughter’s playroom. It is so bright and happy; even though she is not quite 1, she loves to look at it. The other is the peacock and it is at the bottom of our stairs – colorful and eyecatching, it fills a tiny space like a jewel. These prints are darling! I particularly love the “protect our water” print – the whale is a good one for our New England home. Keep up the good work! Love the bright colors. I would love to add these to our nursery. I love how unique they are! Protect our water!!! I love these prints… They are sweet and colourful and I’d love to put them in my princess’ bedroom! I follow you blog by e-mail. I think adding the messages to the cute pictures adds to the meaning. I especially think the whale picture is very relevant with the oil situation in the Gulf. I love them all, but the whale is my favorite! And a few other places on my blog, as the post above explains. I have 8 entries! Wow, apparently I REALLY like your work! Love this colours, I understand now that I don’t have achance to win, but … I’ll became a follower, I’ll say I love you in facebook, just because I’m a sportive spirit ! « Sample Sale- up to 70% off! !